Leading up to Fastlane 2015, two things were evidently true. The first was that Roman Reigns—coming off a Royal Rumble win in January where he was booed heavily while The Rock stood by his side—was on a serious run towards the WWE Championship despite the crowd reactions. The second is that there was a renewed fervor around Daniel Bryan and the “Yes!” Movement. Bryan had just recently returned from a neck injury that was thought to be potentially career-ending—and one that would force him to briefly retire just a few months later—and fans were itching for him to get back the WWE Championship he never lost. Both men looked to keep their momentum going at Fastlane in 2015, where Roman Reigns, having been manipulated by The Authority into putting his title opportunity on the line during an episode of RAW in February, competed against Daniel Bryan to determine who would go on to main event WrestleMania and challenge Brock Lesnar for the WWE Championship he’d held since demolishing John Cena at Summerslam in 2014. In other words, both Reigns and Bryan had plenty of motivation heading into the match, each of them battling against the whims of The Authority in an attempt to get a shot at Lesnar. Early on, the match is the story of competing styles. Bryan is cagey from the get-go, hopping around the ring and keeping his opponent at a distance. 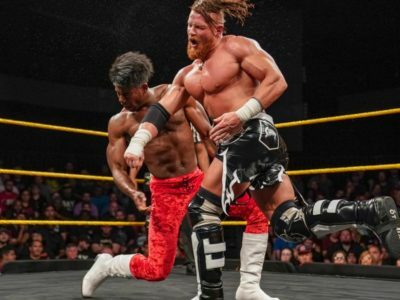 He knows he doesn’t want to get in close to Reigns and allow him to use his power to gain an early advantage, so he creates space by hitting Reigns with quick strikes. It’s a strategy that clearly frustrates Reigns. When Bryan puts him in a headlock and then takes him down with a drop toe hold, Reigns can only scurry into the corner and look exasperated. This is not the kind of match he wants to be wrestling. So, the next time Bryan tries to lock in a submission, this time a surfboard, Reigns powers out. He gets to his feet, but Bryan is quick in keeping him grounded. He ducks a few clotheslines and then goes for his own running clothesline, building a ton of speed off the ropes. But the power advantage comes into play, as Reigns cuts him off and uses that momentum to hit Bryan with a nasty tilt-a-whirl slam. This puts the match firmly in Reigns’ control. He manhandles Bryan, throwing him to the outside so that he can ram him into the barricade and the apron over and over again. Back in the ring, Bryan, weary now, tries to slow Reigns down with more kicks to his hamstrings. It works for a while, as he’s able to get him down on the mat and into a submission hold, but Reigns counters with the simplicity of a few rapid punches to Bryan’s face. There’s nothing elegant about Reigns’ strategy, but it works to get him out of those tight spots where Bryan could force him to tap out. Reigns stays on top of Bryan, throwing him around the ring with a few suplexes. It looks like he’s well on his way to victory, setting up for a Superman Punch while Bryan struggles to get up in the corner. But when Reigns goes for his signature move, Bryan hits him with a kick to the gut in midair. Just a few months prior to this match Reigns had to have emergency surgery because of an incarcerated hernia, so this blow does extra damage. It clearly takes a lot out of “The Big Dog,” who struggles to get back up, and from there Bryan is able to take control. Bryan does so by getting Reigns on the top rope and slamming him down with a massive back suplex. That move gets him a near fall, and when Reigns kicks out Bryan immediately transitions into the Yes Lock. Reigns manages to get to the ropes and escape to the outside, but Bryan is feeling that win getting closer. He knows this is his opportunity to take down Reigns and go on to the main event of WrestleMania. He doesn’t let Reigns catch his breath. He hits him with a suicide dive. He runs back into the ring and hits him with another one. He goes for one more, but Reigns counters this time, hitting him with a belly to belly suplex that sends Bryan flying. Reigns, desperate, tries to run him over, but Bryan moves out of the way and Reigns slams into the steel steps. Both men, throwing everything they’ve got at each other, struggle to get up, barely making it into the ring before the referee counts them both out. With WrestleMania hanging in the balance, Bryan and Reigns go back and forth with incredible determination during the final stretch of the match. Reigns hits Bryan with a Superman Punch, but it’s not enough to keep him down for the three count. Bryan counters a spear into a roll-up that almost gets him a win, and he follows that up with his patented running knee. Reigns kicks out of that too though, and Bryan is left wondering what else he could possibly do to keep “The Big Dog” down. He decides it’s time to just pummel Reigns. He hits him with a flurry of Yes Kicks, and then puts him in the Yes Lock. Once again though, Reigns finds a way to power out, clubbing Bryan with one forearm after another until he’s forced to let go of the submission. The two men, sitting on the mat, stare at each other before trading blows. Strategy has gone out the window: Now, there’s only slugging this thing out until the end. Bryan gets the better of Reigns, and that leaves him room to back up into the corner. He preps for another running knee, the crowd erupting in “Yes!” chants. 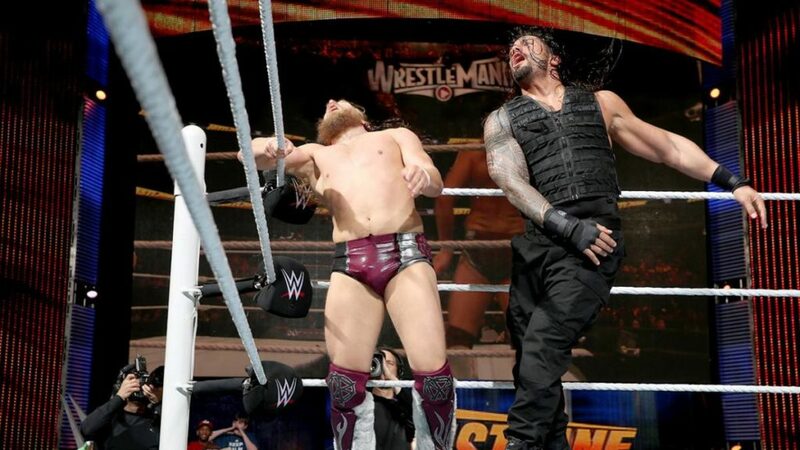 But, as Bryan dashes across the ring, Reigns recovers and counters the running knee into a deadly spear. This time, there’s no getting up. Bryan is down for the count, and Roman Reigns secures a date with Brock Lesnar and the WWE Championship at WrestleMania 31. You can watch this match in its entirety along with the rest of Fastlane 2015 on the WWE Network.